NoiseAsh 에서 Action Delay ($29) 라는 플러그인을 발표하였습니다. 원래 가격인 $90 인데, 출시 세일로 $29 에 판매를 한다고 합니다. 단순한 딜레이만 되는 플러그인은 아니고 4 In 컨셉으로 4가지 기능이 하나의 몸체에 있는 플러그인 입니다. Delay - Chorus - Reverb – LoFi processor 이렇게 4가지 기능이 하나의 플러그인에 있는 종합 FX 플러그인 입니다. 이런 여러가지 기능을 활용하여 Classic tape delay, ping pong delay, wide stereo sync delay, haas effect, long sequenced delays, experimental psychedelic sound design effects 같은 다양한 이펙터 효과를 만들 수 있습니다. 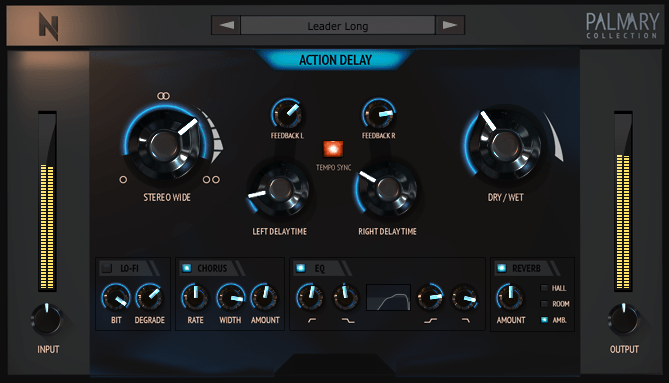 Tempo Sync and free delay modes with individually adjustable L / R channel settings. Reverb unit for dry and wet signals with 3 High Definition reverb modes. 아래 참고링크로 가시면 데모 버젼을 다운로드 받으실 수 있습니다.